Traffic Displays finished out 2016 and started 2017 with Mobile Billboard advertising campaigns for 4 of the nation’s top cell phone carriers. 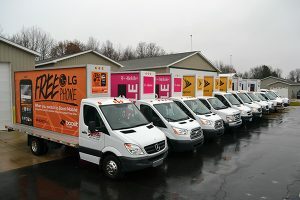 T-Mobile, Metro PCS, Boost Mobile and Sprint Mobile were all advertising their new plans to their customers using Traffic Displays Backlit Mobile Billboards. The wireless companies found Mobile Billboard advertising to be a great way to get their advertisement in front of holiday shoppers. Want to book your campaign? Call 616-225-8865 to Go Mobile today!